Apple has officially released the full and final iOS 9.2.1 Firmware (Build: 13D20 / 13D15) version to general public users and iOS developers worldwide with the inclusion of some exciting new features and functionalities. The latest iOS 9.2.1 update is instantly available for installation and upgradation on all iDevices. The official Direct Download Links of iOS 9.2.1 Final .IPSW Files for iPhone 6S Plus, iPhone 6S, iPhone 6 Plus, iPhone 6, iPhone 5S, iPhone 5C, iPhone 5, iPhone 4S, iPod Touch 6G, iPod Touch 5G, iPad Pro, iPad Air 2G, iPad Air, iPad 4, iPad 3G, iPad 2G, iPad Mini 4G, iPad Mini 3G, iPad Mini 2G and iPad Mini is attached below. Currently, no PanGu, 25PP or TaiG Jailbreak Tool is compatible for iOS 9.2.1 Jailbreaking. 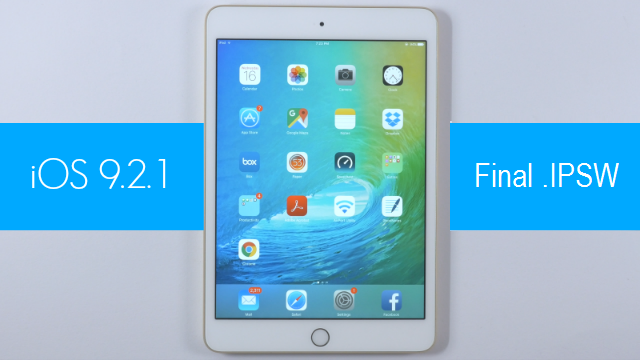 How to Install iOS 9.2.1 Manually? You can navigate to Settings > General > Software Update option for iOS 9.2.1 OTA Update. Apple iOS smartphone and tablet device users can also download, install and activate iOS 9.2.1 without UDID developer account via iTunes for free.